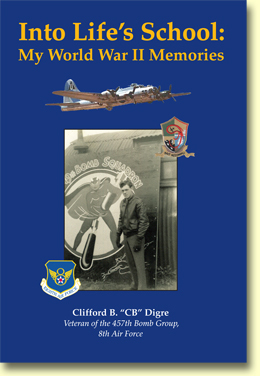 Into Life’s School: My World War II Memories was written by a WWII veteran—Cliff Digre—who grew up in southwestern Minnesota and now lives in south Minneapolis. The book measures six inches wide by nine inches and is almost one inch thick. It has 332 pages and 160 images (not including the images of the reproductions of loading lists and track charts in Appendix C). The text is set in 11.5-point Times. The book is printed on 60-pound pure white archival text-weight paper stock. The cover is reproduced in four-color process inks. Both hardcover and paperback editions are available. The hardcover version of the book sells for $25; the paperback version sells for $15.95. For a sampling of the book, see the Table of Contents and Excerpt One, Excerpt Two, Excerpt Three.